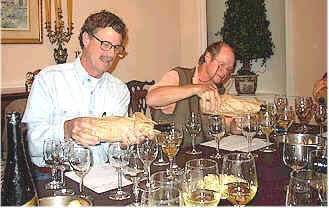 I had my doubts when Jim Sweeney (pictured on the left) called to say he was organizing a tasting of Austrian whites. Not that the wines from Austria are not good quality, but the idea of comparing Grner Veltliner with Riesling struck me as doing a Loire Valley tasting and comparing Sauvignons with Chenin Blancs. Jim assembled four examples of each, selecting from a nice range of estates. I'd be surprised if any of the Vino Fino crew had much experience with Grner Veltliner wines, so telling one from a Riesling was certainly a challenge. There was nothing "wrong" with this wine. It displayed a bare hint of the spice notes of Grner Veltliner, but was simply light and of standard quality. Not bad, but nothing special. Displaying honeyed notes and showing signs of maturity, this wine had a ripe melon character on the nose. 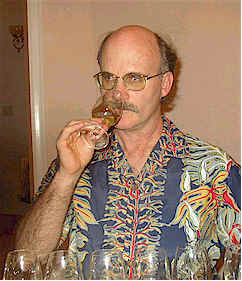 The same "older" or mature notes are evident on the palate. One star (on a three star scale, no stars being "standard" quality). Here's another "nice," but relatively "little" wine. It's got a hint of the spice notes typical of Grner Veltliner and a dusty element to the fragrance. Perfectly pleasant, it's a simple dry white. There's a faintly floral element to this nice, lemony, crisp, dry Riesling. One half to one star. This wine combines an element of spiciness with the floral qualities of good Riesling. There's a minerality that runs through the fabric of Prager's Riesling that is quite attractive. I found the flavors to be dry, crisp and somewhat stony. Very fine. One-and-a-half stars. After handing in his ranking of the wines, Ernie Anderson (not pictured on the right...that's the Peerless Gary Peer), Esquire asked how you can identify a Grner Veltliner. 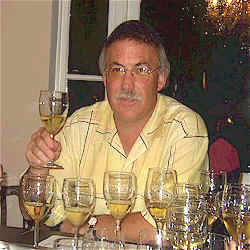 As all the votes had been cast and Timmy Z was busy tabulating them, I replied, "When it smells and tastes like Wine 'D', there's a good chance it's a Grner Veltliner." Here's a wine with a lovely spicy, almost peppery quality on the nose and palate. I found a very slight hint of mushrooms and some stony notes to the nose here. The flavors are equally elegant with a mildly bitter grapefruit peel character, too. Very fine! Two stars. The nose is almost misleading on this wine, showing mildly fruity and very clean characters. It's nice, but not nearly as profound as the wine is on the palate! There's a really nice texture to this with plenty of fruit...fresh, bright and crisp with a very long finish. One-and-a-half to two stars. As with Brndlemayer's other entry in this tasting, the varietal character is in the spotlight and well-lit, it is! Very fruity and mildly floral, there's no mistaking the Riesling character here on the nose. The same qualities show up on the palate with the slight enhancement of a stony or minerally character. Very fine! Two stars+.